As a veteran of the MOBA genre I was looking forward to Switchblade in hopes that it would bring something new to the genre. A hybrid of the ultra competitive League of Legends mixed with the casual nature of Rocket League. What we ended up with is a hybrid of those two titles that is easy to pick up and play. Unfortunately, Switchblade is more Heroes of the Storm than League of Legends and as a result does bring a casual MOBA to the PlayStation. Switchblade is one of the easiest games I have ever played. In my first match I scored a pentakill against the enemy team as a support vehicle whose main focus is healing. I astoundingly did not record a video with the PS4 Share button. For those new to the MOBA genre, a pentakill is when you get a kill on all five members of the opposing team—similar to an ultra kill in Unreal Tournament. Switchblade has only one enabled mode at this time and is still in Early Access. Players are able to queue for Quick Matches, but Ranked and co-op against bots modes are disabled currently. 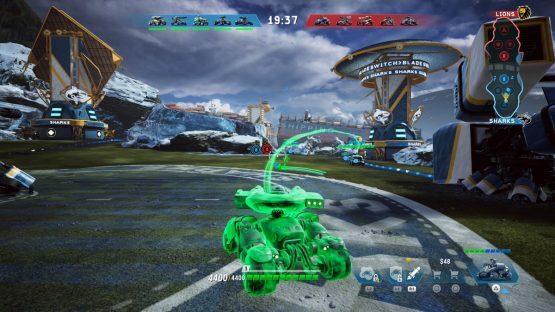 Switchblade is a free-to-play 5v5 vehicle multiplayer online battle arena (MOBA) where matches are short and have a twenty-minute time limit. The goal is to fight the enemy team, destroy the enemy team’s towers that guard their base, and finally push to destroy said base. The controls feel very similar to Geometry Wars. Left stick moves and right stick aims. You have an auto-attack, two signature abilities, and an ultimate. These abilities differ based on the car you select. Players select two vehicles that can be swapped out at any time. Once the battle begins, you’ll select your first ability and use the shop to purchase consumables or vehicle enhancements. Consumables include healing yourself and those around you, a damage buff for a few seconds, and others. The vehicle enhancements are health, damage, shields, healing, or vehicle speed. Cars come in five roles such as the support armored role. Artillery are long distance fighters and quite slow. The Tank is your big beefy car that is best at being on the font lines. Scouts are quick, agile, and have disruptive abilities such as the Goo ability. Lastly, we have the Fighter role. I launched the game and was forced into a decently robust character creator that confusingly labels the ability to change your gender as “body type.” Also, the world of Switchblade seems like it’s an empty one. You enter the arena after character customization and there are a few NPCs walking around, but no players. 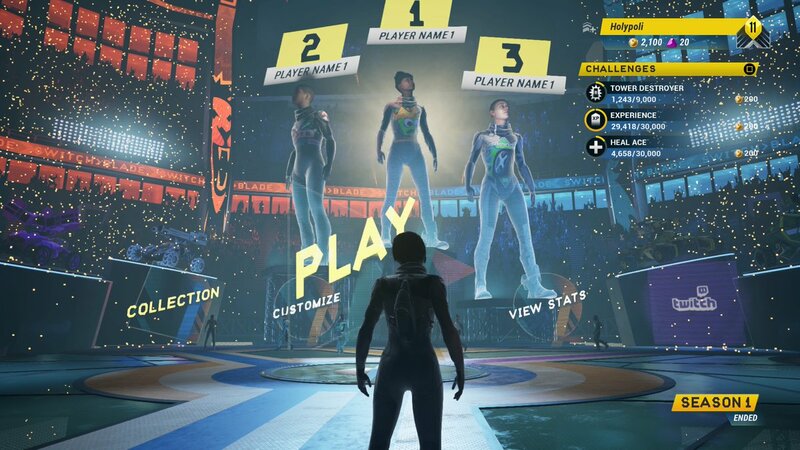 Unable to interact with anyone here, you can view daily challenges, play a match, visit the real money store, customize your human character, or view your stats. The ability to open Twitch in the PS4 browser also exists, though I don’t know why you’d want to watch a stream of a game you are currently playing. After you have entered the arena the crowd goes wild. The loud cheering of the fans never ends, it seems, and will drown out any thought you may have. It keeps going through the quick match queue timer, beyond the vehicle selection screen, and only stops when the match begins. Once you enter a solo Quick Play match, the first thing you should do is create a private party chat on PS4. This will negate your ability to communicate with your teammates which I felt never impacted my games. The game is currently missing any option to turn off in-game chat which impacted my ability to hear the announcer during a match, and creating the private party eliminated the distraction. Speaking of confusing decisions, the prevalence of the premium currency—called Bitcash—is one of them. At the time of writing, there is an issue on their in-game store where it shows 1,920 Bitcash for $3.99 USD. After selecting this it takes you to their premium currency tab and now shows the 1,920 Bitcash for $24.99 USD. $3.99 USD will only net you 200 Bitcash. The team at Lucid Games has a multitude of items to purchase for real money, including Battle-Point Boosts, vehicles and skins, logos to add to your flight suit, hair color, different color eyes, and make-up. The only thing I can’t purchase with real money is emotes, as the five that are currently in the game are all unlocked. Completing matches, daily quests, and leveling up vehicles are the only way to earn Battle-Points. Battle-Points are used to buy all the vehicles in the game and most skins. They are accrued slowly and you’ll be grinding a ton if you choose not to purchase Bitcash. There are currently seventeen cars in the game, and Lucid is selling a Legendary Pack, which costs 1,600 Bitcash. It will net you everything plus every vehicle, forever. If you do the math, you’ll need more than $20 worth of Bitcash to get every vehicle forever. I like Switchblade, and I wish it was better. The constant crowd noise in the game lobby and hub area is akin to nails on a chalkboard. Prices on vehicles are way too expensive with the current amount of Battle-Points you get per match. Lucid Games disabled two key modes of this game before the PS4 version’s launch with no details on when they will be enabled. It has something that attracts me to play, but lacks a core loop like the most popular MOBAs and Rocket League. The progression feels non-existent, the inability to unlock cool cosmetic stuff without paying real money, logging in everyday and hoping their premium currency is the gift that day, or leveling up each individual car feels like a needless grind. It’s important to keep in mind that all of this is still in Early Access and the game is free-to-play, so many things are subject to change. The gameplay in Switchblade is crisp and you’re never fighting with the controls. Even though the announcer talks nonstop during a match, it is pretty helpful relaying important information. I’m looking forward to see what improvements Lucid Games makes when it comes out of Early Access. Switchblade review code provided by publisher. Version 1.15 reviewed on a PlayStation 4. For more information on scoring, please see our Review Policy.